He is the most dangerous man alive. He only wants to live in peace with his family, and forget the war that nearly killed him. . . It's not going to happen. Stephen Hunter's epic national bestsellers, Point of Impact and Black Light, introduced millions of readers to Bob Lee Swagger, called "Bob the Nailer," a heroic but flawed Vietnam War veteran forced twice to use his skills as a master sniper to defend his life and his honor. Now, in his grandest, most intensely thrilling adventure yet, Bob the Nailer must face his deadliest foe from Vietnam--and his own demons--to save his wife and daughter. During the latter days of the Vietnam War, deep in-country, a young idealistic Marine named Donny Fenn was cut down by a sniper's bullet as he set out on patrol with Swagger, who himself received a grievous wound. Years later Swagger married Donny's widow, Julie, and together they raise their daughter, Nikki, on a ranch in the isolated Sawtooth Mountains in Idaho. Although he struggles with the painful legacy of Vietnam, Swagger's greatest wish--to leave his violent past behind and live quietly with his family--seems to have come true. Then one idyllic day, a man, a woman, and a girl set out from the ranch on horseback. High on a ridge above a mountain pass, a thousand yards distant, a calm, cold-eyed shooter, one of the world's greatest marksmen, peers through a telescopic sight at the three approaching figures. Out of his tortured past, a mortal enemy has once again found Bob the Nailer. 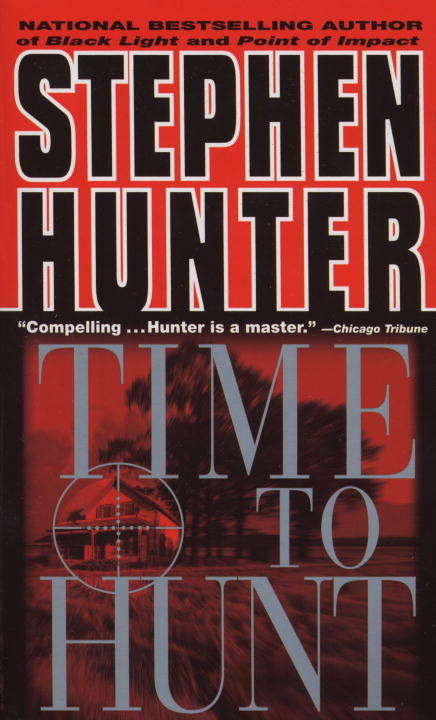 Time to Hunt proves anew why so many consider Stephen Hunter to be our best living thriller writer. With a plot that sweeps from the killing fields of Vietnam to the corridors of power in Washington to the shadowy plots of the new world order, Hunter delivers all the complex, stay-up-all-night action his fans demand in a masterful tale of family heartbreak and international intrigue--and shows why, for Bob Lee Swagger, it's once again time to hunt. From the Hardcover edition.